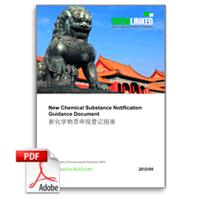 Jun 25, 2015 saw the official release of the draft of the revised China New Chemical Substance Notification Guidance after more than 1 year of deliberation. The draft is now open for public consultation until 31 July, 2015. Primary changes in the revised draft focus on the applicable scope, management policy, data requirements and waiving, notification procedures, requirements of risk assessment report and post-notification requirements. Compared to the current guidance, when promulgated the new one will impose a more comprehensive management on new chemical substance notification in China.